Man is a complicated creature, which is something that we are shown time and time again. One of the most important, defining characteristics of man is his ability to love. That is the concept I wanted to capture. This image is a very simplistic commentary on the two sides of love, the light and the dark. On the technical side, I am fascinated with the idea of sunbursts without sunlight. I used my external flash as the light source and bounced it off the inside of the subject. 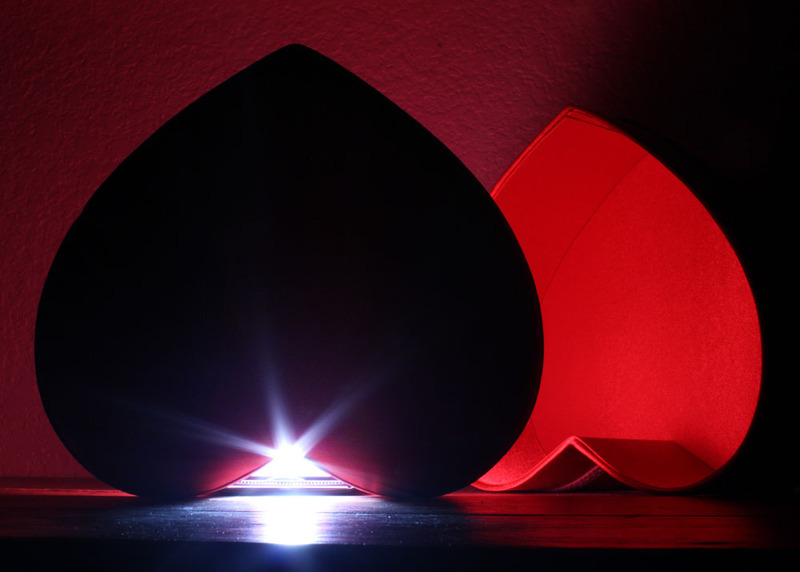 By positioning the flash unit inside the lid of my heart box, I was able to bounce a lot of that light around and create dramatic shadows that outline the shape of the lid. This also caused the white background to flood with the rich red color that dominates the photo. I faced this image with the idea of creating something vibrant and moody while only using one source of light. As you can see, the only light for my subject is the flash unit. The focal point of the image is the light burst, but what tells the real story is the sharp contrast between the textured red background and the stark black silhouette of the box lid. The tension created by these colors repeat on the right side of the image. The dark shadow of the box forms the heart’s shape and leads the eye right back to the brilliant light burst. The lines in the image move the eye around in a circle. That cycle is what I wanted to communicate, that life’s experiences have a way of coming back around and that love finds a way even in the darkest times. I used a Canon Rebel T3i to capture this image. I set the f-stop to f/25, my exposure time was 1/30 of a second and I set the ISO to 800. I needed to keep my f-stop as low as possible to create that strong light burst effect. My lens is an 18 mm – 55 mm lens, and I captured this image with the lens set to about 28 mm. The flash unit that I used is a Neewer TT 560. I connected the flash unit to a Neewer FC-16 wireless receiver and had the transmitter attached to my camera so that the flash unit would trigger at the exact moment I needed it, especially important given my exposure time. I used Adobe Lightroom as my post processing software. Within Lightroom, I cropped the image down to create a little more tension and cleaned up a few spots created by dust on my camera’s sensor. My name is Rita DeBrodie. I am an Electronic Media and Film major at Northern Arizona University and my minor is Photography. My background is in small productions and screenwriting and I believe that often the smallest details are the most important. I face all cinemagraphic tasks with the eyes of a photographer, trying to capture that perfect moment with a subject and tell a story that will awe and enlighten an audience. I prefer small scenes that convey a larger meaning in photography and I use strong contrasts and leading lines to pull focus to my subjects.